GravDept’s specialty is designing responsive eCommerce experiences that stabilize our multi-device world. It’s simple attraction. 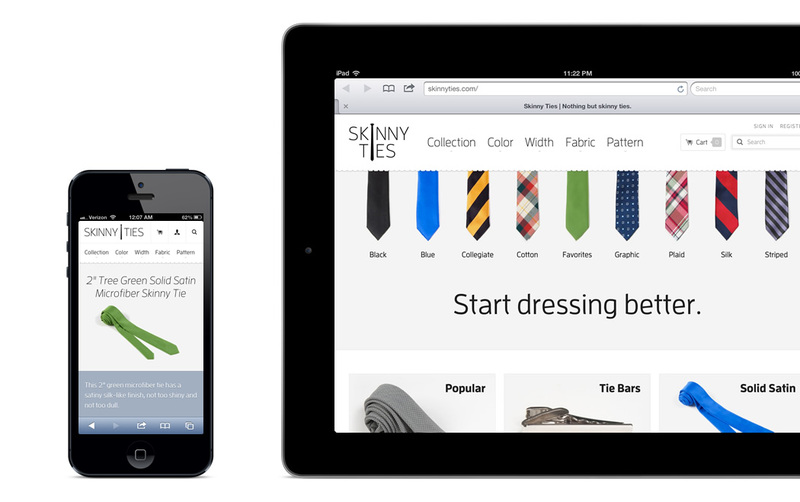 Gravity Department imagined, designed, and built a responsive website for Skinny Ties because shopping happens everywhere and on every device. GravDept is the independent consultancy of Brendan Falkowski. My focus is design, frontend development, and strategy for many devices. I have a knack for Magento eCommerce and organizing complex constraints. A professional-grade foundation for mobile first, responsive design with Magento Enterprise. The smartest, most extensible Magento theme is also a best-seller. That’s no coincidence. GravDept’s principles, standards, and practices for trailblazing the web.